In 2002, Achieve, Inc. and the Lead States released the first draft of the Next Generation Science Standards, commonly known as the NGSS, for public comment. These standards were meant to provide a coherent set of internationally-benchmarked guidelines for K-12 science teachers across the nation. In response, the American Association of Physics Teachers (AAPT), the American Physical Society, the American Chemical Society, the American Institute of Physics, the American Society of Engineering Education, and the Department of Energy compiled feedback on the first draft of the standards. 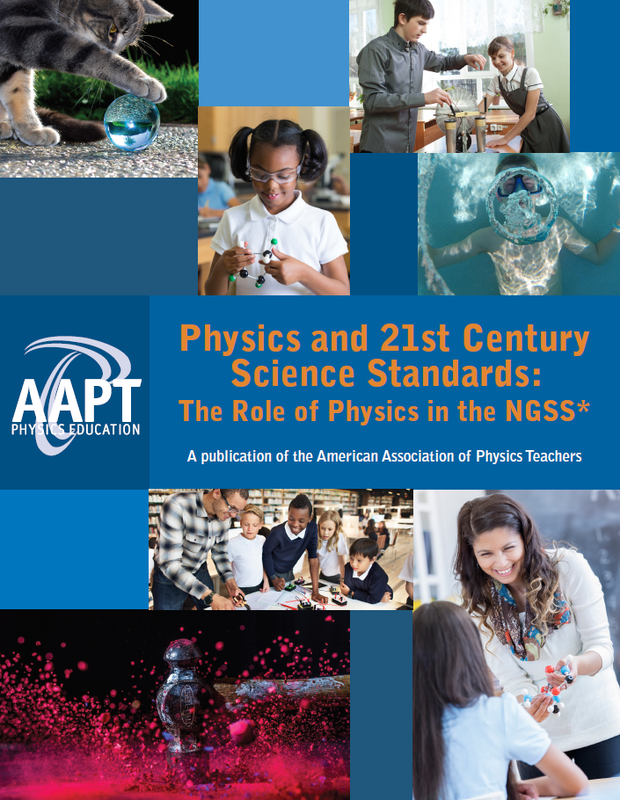 Upon release of a revised version of the NGSS, the AAPT created an additional focus group comprised of persons involved in high school physics education. The AAPT responded again. This response, from February 1, 2013, described both their support for standards based upon the National Research Council and National Academy of Science's Framework for K-12 Science Education: Practices, Crosscutting Concepts, and Core Ideas, while also identifying some weaknesses and omissions in the standards with recommendations for improvement. The AAPT supports the spirit and purpose of the NGSS as implemented in the context of the Framework for K-12 Science Education, but does not endorse any set of standards. Please refer to the AAPT's physics focus group's final response to Achieve about the NGSS for details. It is my hope that this document will help K-12 teachers of physics to better understanding how their classroom practice is aligned with the NGSS or how it can be effectively aligned if your state or your school adopt the NGSS. To learn more about this publication, please contact AAPT K-12 Program Manager Rebecca Vieyra at rvieyra@aapt.org. Digital download: Scroll down below to request your free copy! Hard-copy: Purchase from The Physics Store. *Note: By submitting this information, the AAPT may contact you to let you know about membership, program opportunities, and additional resources.